Working at the top-end of haute horlogerie, Van Cleef & Arpels watches must, of course, be flawless examples of the many trades involved. 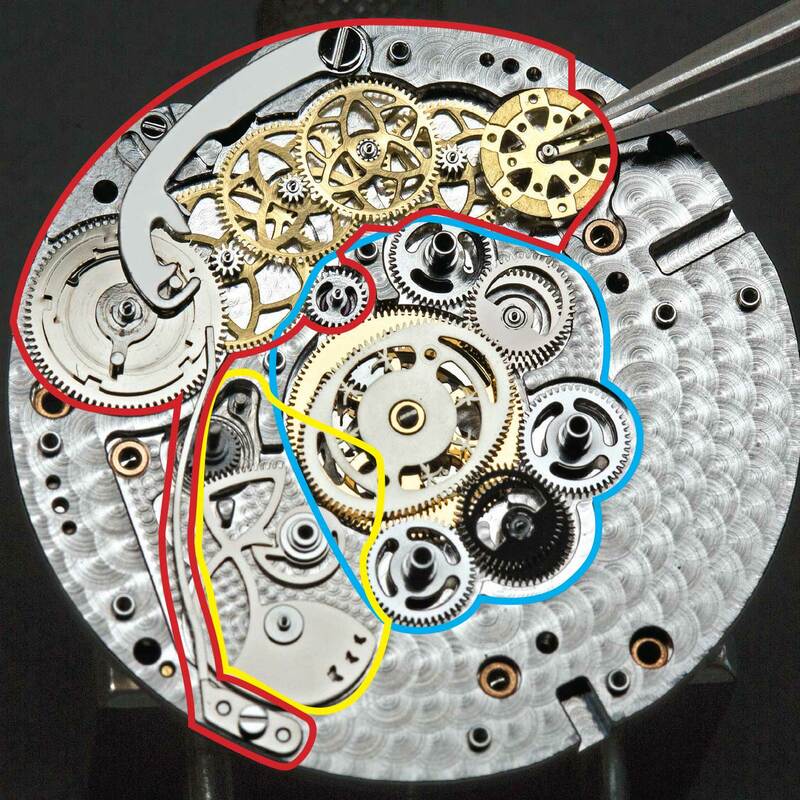 For the watchmaker, the most novel and complex of these is the Ronde des Papillons. The hours are indicated by the wing of a swallow and the minutes by circling butterflies which move at varying speeds. This variation becomes more obvious when the one-hour relay is run in ten seconds – a performance that can be repeated at will at the press of a lateral pusher. Gears – or “wheels” as horologists tend to call them – are usually round, and a sequence of such wheels will turn at constant speeds depending on their relative numbers of teeth. There has long been a fascination, however, in producing gears that are not round. Producing novelty systems using triangular, square, or even clover-leaf shapes was a popular pastime for Victorian gentlemen in their home workshops. Enthusiasts now conceive of even more elaborate systems using CAD programs on home computers. The varying speed of the butterflies in the Ronde des Papillons is due to the use of oval gears. A partially dismantled under dial view of the Ronde des Papillons movement to show its major features. The system of oval wheels controlling the butterflies is outlined in blue; the retrograde action of the swallow, in yellow; and the on demand mechanism for the rapid performance, in red. The movement was designed and developed by Jean-Marc Wiederrecht, CEO and co-founder of independent manufacturer Agenhor. This firm has worked with VC&A since 2003, specialising in movements with retrograde displays. In these, instead of going in a circle the indicators proscribe an arc, jump back to their origin, and start again. Such mechanisms usually employ slender, lightweight hands to indicate the time. 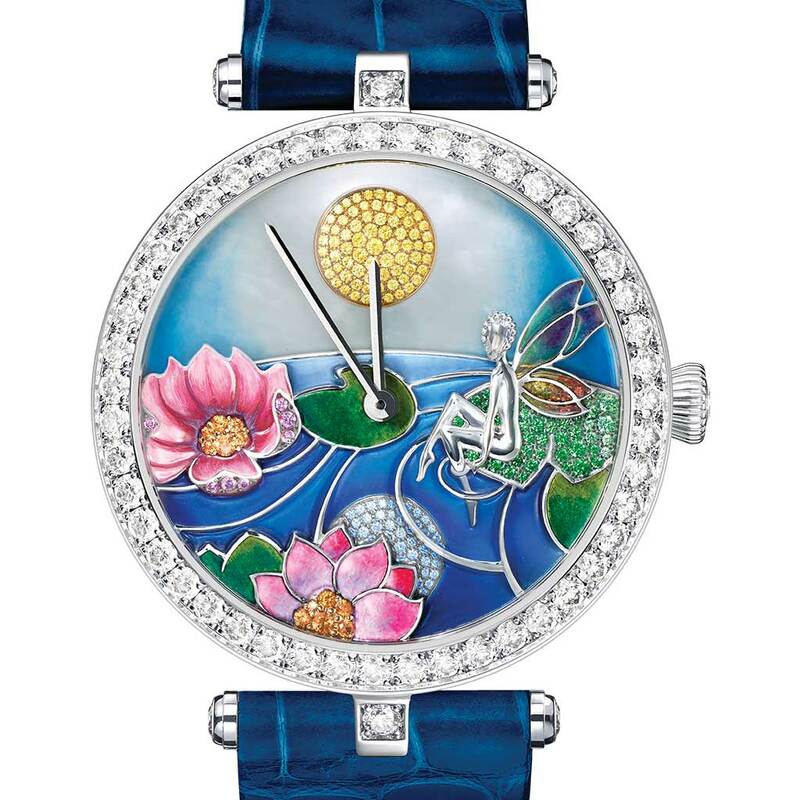 Wiederrecht’s first assignment for VC&A was to produce the Lady Arpels Féerie, featuring a large central fairy, sculptured in white gold, indicating the hours by raising a diamond-tipped wand and the minutes with a diamond-set wing. In watchmaking terms, these “hands” were very heavy. Considerable inertia had to be overcome to get them moving and, more importantly, the momentum accommodated when they flick back. A juddering halt, or perceptible “clunk”, would be inelegant and ultimately destructive. The central oval wheel, A, is mounted on a large conventional wheel driven by the time train. It turns in two hours. A drives a smaller oval wheel, B, which has half as many teeth and so turns once an hour. A turns at a constant speed but the speed of B must vary due to the varying radii. B is mounted on a round wheel which drives C carrying the 0-30 minute butterfly. Similarly, wheel D drives the 30-45 and 45-60 minute butterflies on E and E’. Wheel D looks rather strange in this photograph as it is non-reflective (the result of the so-called “black polish”) and also casts a strong shadow. 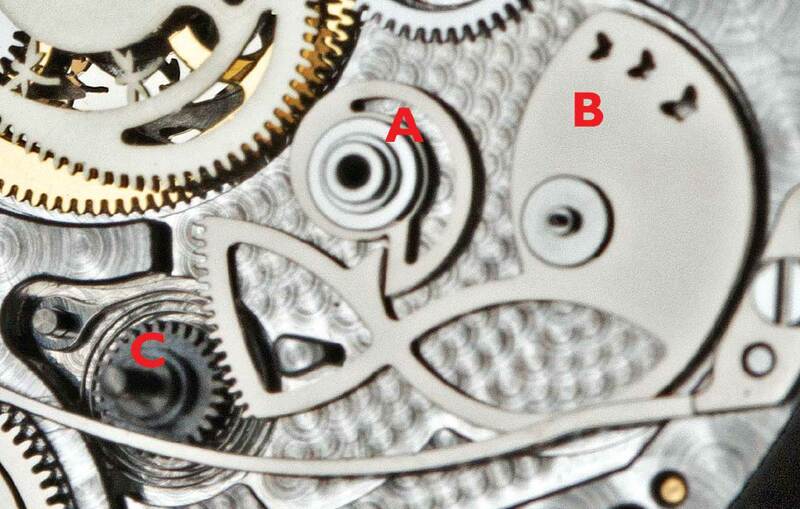 Note the fairy silhouettes forming the crossings in wheel A; such whimsical features, seen only by the watchmaker/repairer, are a feature of Wiederrecht’s work. This example of a retrograde mechanism drives the swallow which indicates the hours. The snail-shaped wheel, A, turns anti-clockwise in hourly jumps twice a day. As it does so it pushes down on the complex lever, B. Teeth at the left hand end of B engage the wheel, C, which carries the swallow, turning it clockwise to indicate the hours. This rotation winds a spring that will make the swallow dart back to zero when, at 12, B passes the longest radius of A. This portion of the movement drives the rapid 10-second flight of the butterflies. 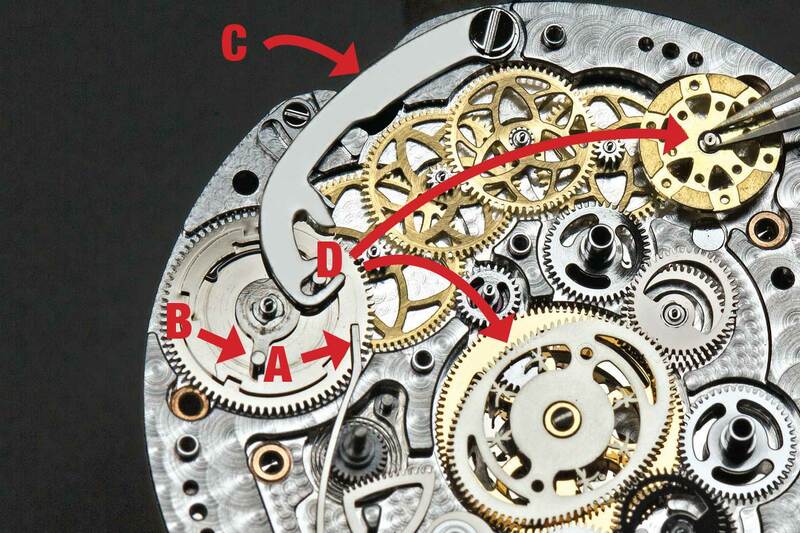 Note that in the partial dismantling of the movement to expose the mechanism, the leaf spring, A, has been displaced. Its top end should be to the left of the pin, B. To actuate the performance, the pusher at C is pressed in. This causes B to force the spring to the left. 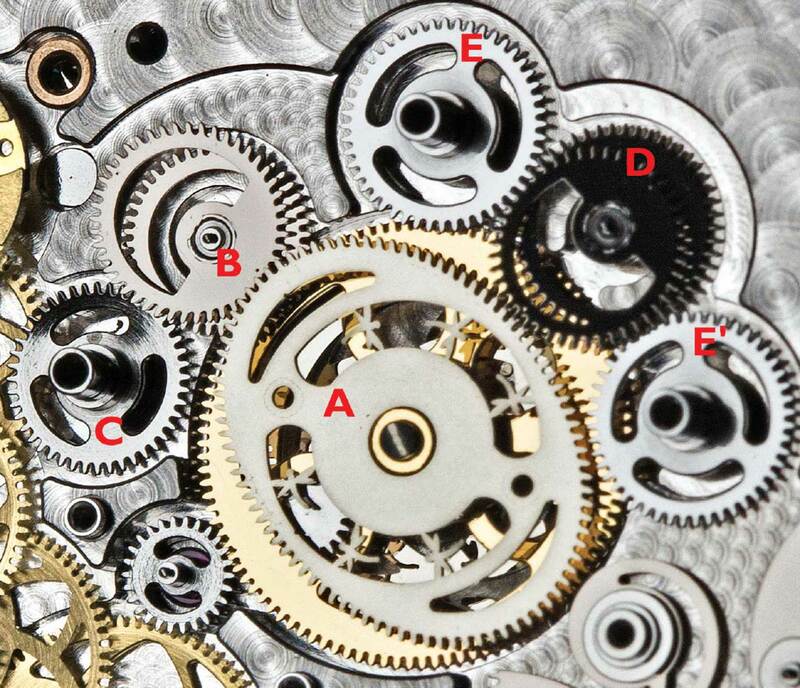 When the pusher is released this spring drives the anti-clockwise rotation of D. This in turn drives both the central wheel, and ultimately the butterflies, and also the train of gears leading to the weighted wheel supported by the watchmaker’s tweezers, which provides an additional load to regulate the speed. The large wheel below A in the centre of the movement is part of a differential (not shown) connecting the repeat train and the time train so that timekeeping continues without interruption. 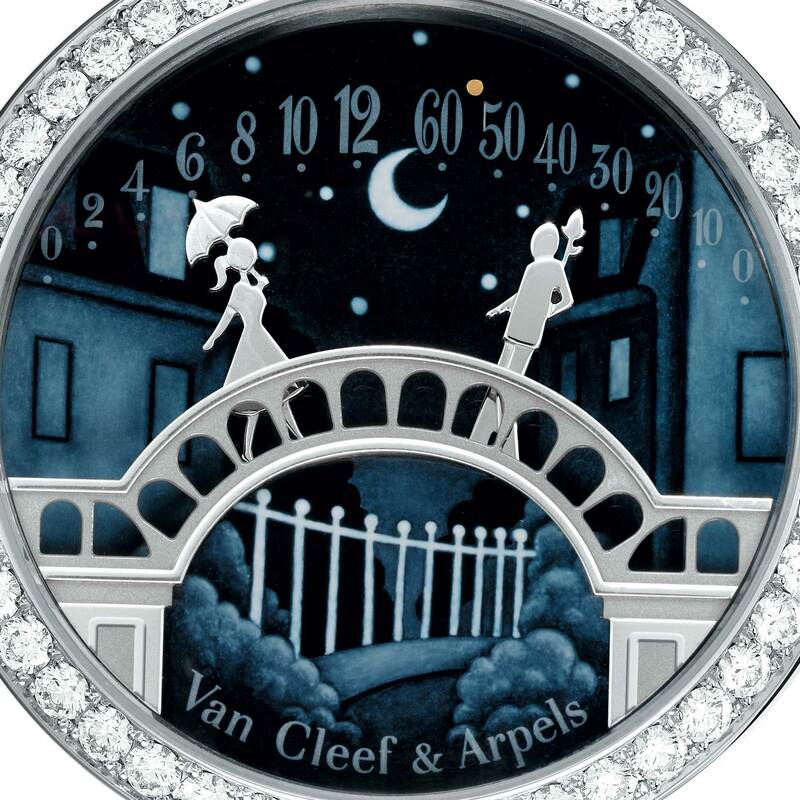 After overcoming these difficulties, the success of the fairy series was followed by further “poetic complications”: a ballerina lifting her tutu; figures pursuing kites against a background of Parisian landmarks; and, last year, the intriguing Lady Arpels Pont des Amoureux. 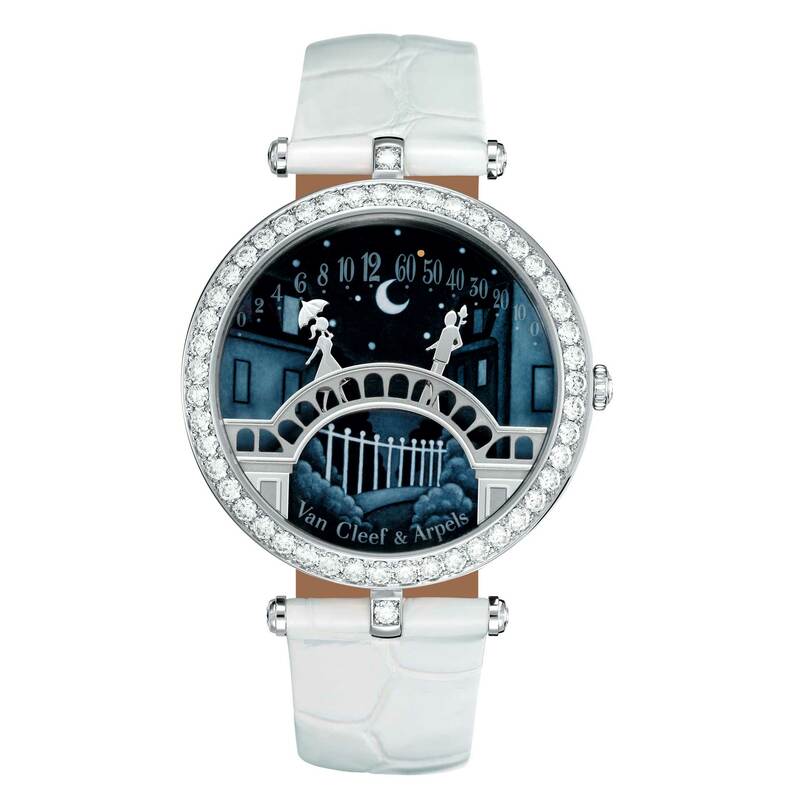 At first sight, the Pont des Amoureux appears to be a straightforward, if beautiful, watch with retrograde indicators. Lovers, or potential lovers, meet at midnight. The man, indicating minutes, ascends to the centre of an arched bridge each hour. 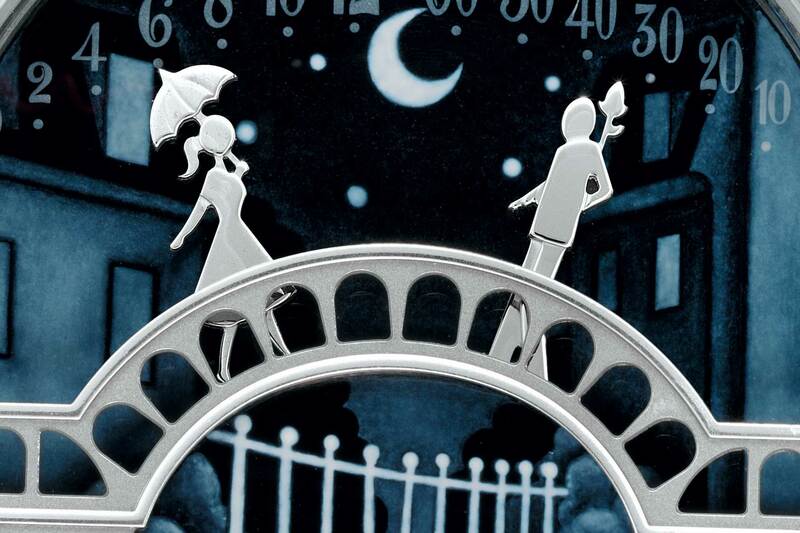 He usually returns disappointed, but at midnight, when the lady marking the hours also reaches the centre of the bridge, the couple linger for a few moments before parting. This also happens at midday, but the scene is clearly set for the witching hour. 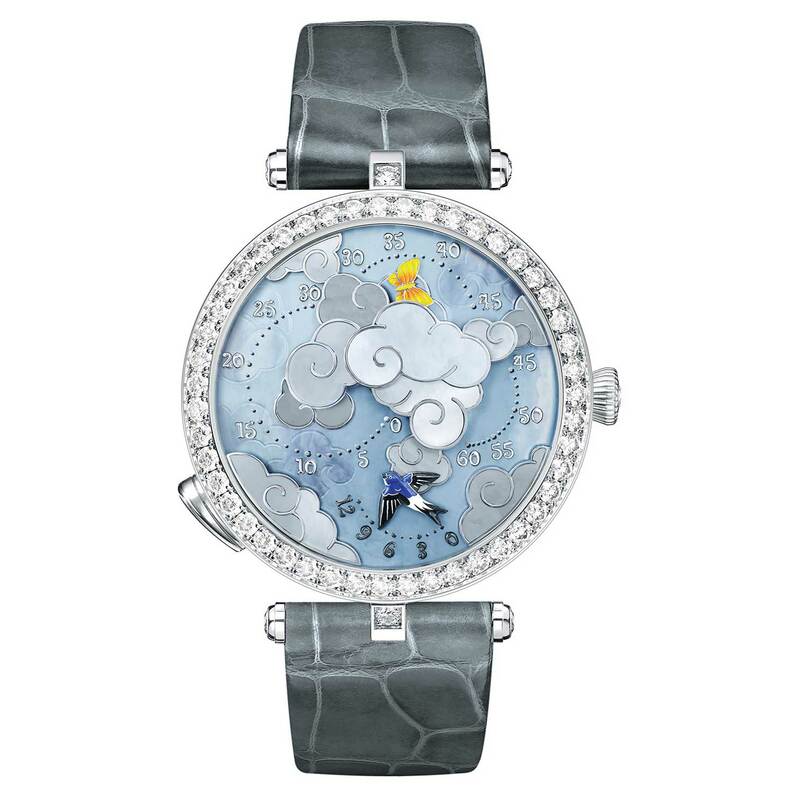 Other watches in the group presented this year have less-complicated animations but are perhaps more stunning as jewellery pieces. Fée Ondine is particularly charming. 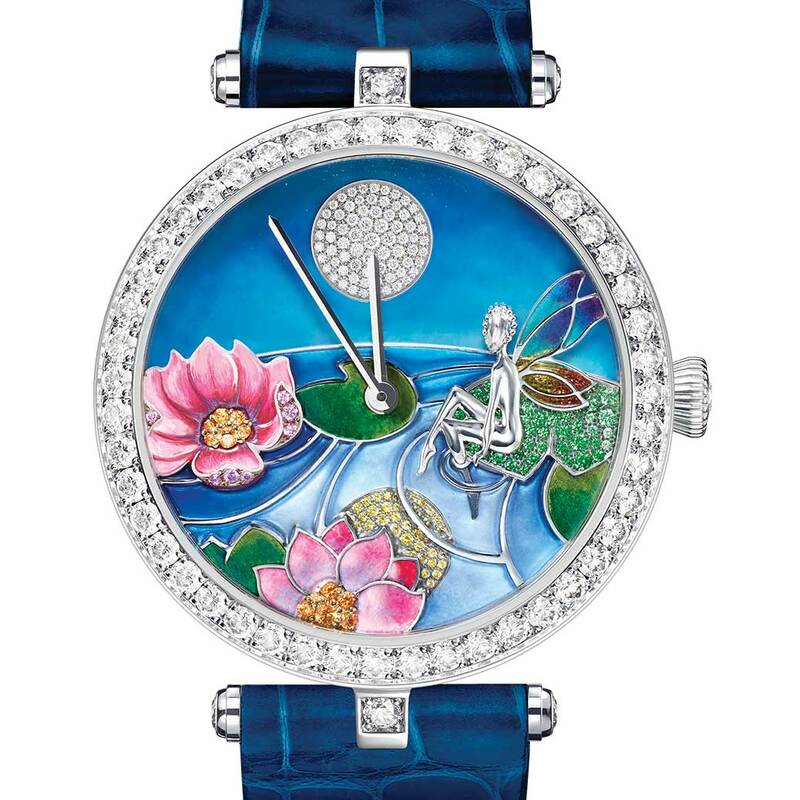 The hands are conventional but the dial features a pond with enamel water lilies and a water nymph seated on a gem-set leaf. 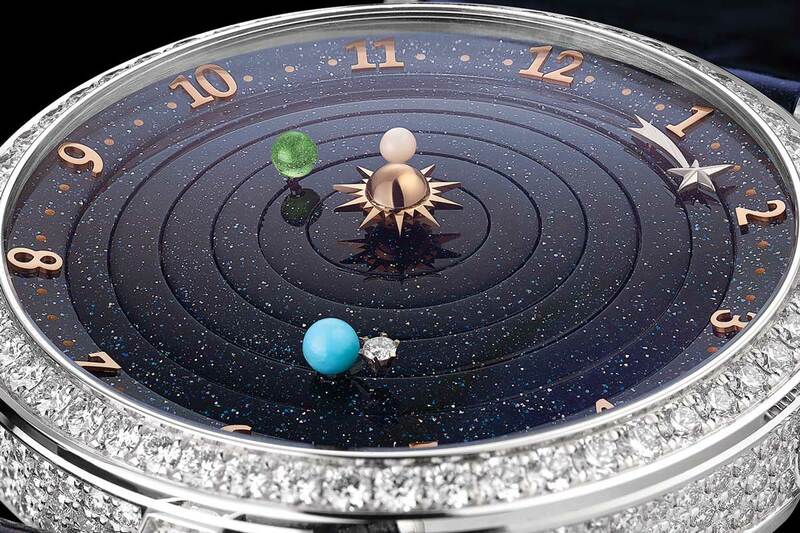 The scene is largely open-worked in white gold and overlays a rotating disc portraying both the sun, set with yellow diamonds, and the moon with white diamonds. Cleverly, around midday the moon appears to be a reflection of the sun in the water and at midnight the haze around the sun appears to be shimmering moonlight on the surface of the pond and the sun a reflection of the moon. The rotating disc theme is continued in Lady Jour des Fleurs. In this case, the disc rotates twice a day and we see very little of it at any one time. 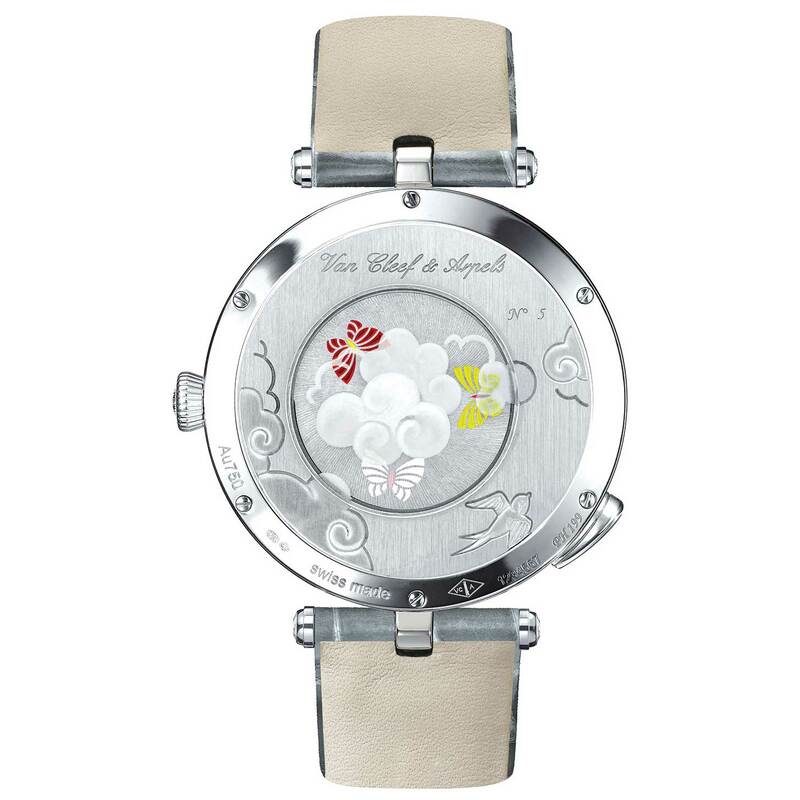 The fixed white-gold dial is almost completely covered with snow-set white diamonds and the occasional ruby. Snow-setting is a particularly demanding technique as diamonds of various sizes are used. The same technique is used for the diamond-set bezel. The result is that the diamond facets produce a unique sparkle. A white-gold spray of leaves curving around the lower left of the dial has the “leaves” cut out, revealing part of the disc below set with coloured stones, including areas of green, yellow, orange and red. The leaves change colour on a 12-hour cycle. 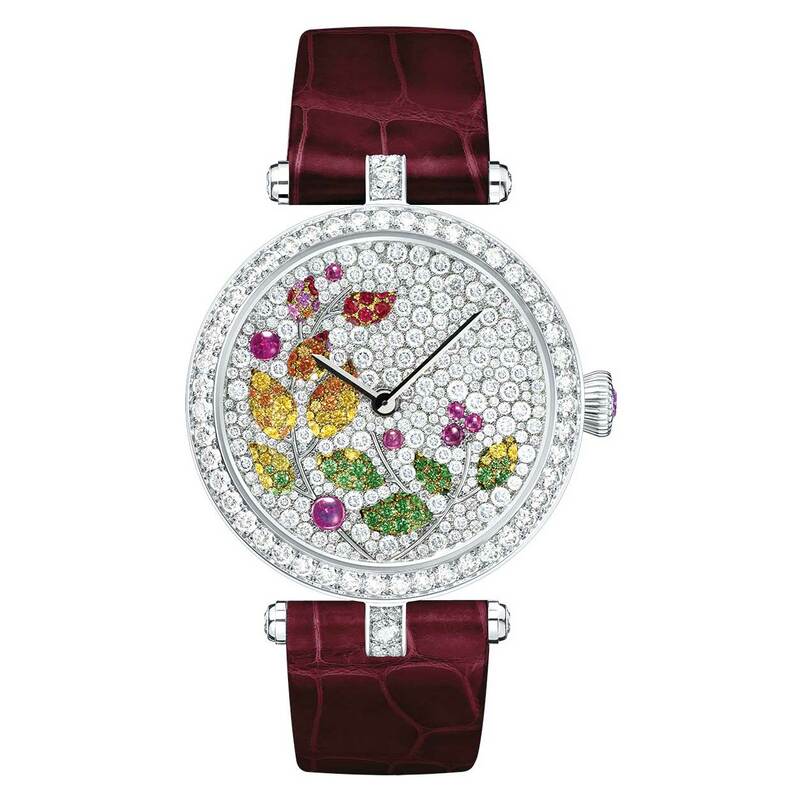 I wonder if the wearer comes eventually to tell the time by the colour of the flowers. For all its 120 years of tradition, VC&A is prepared to also engage in a little high-tech. 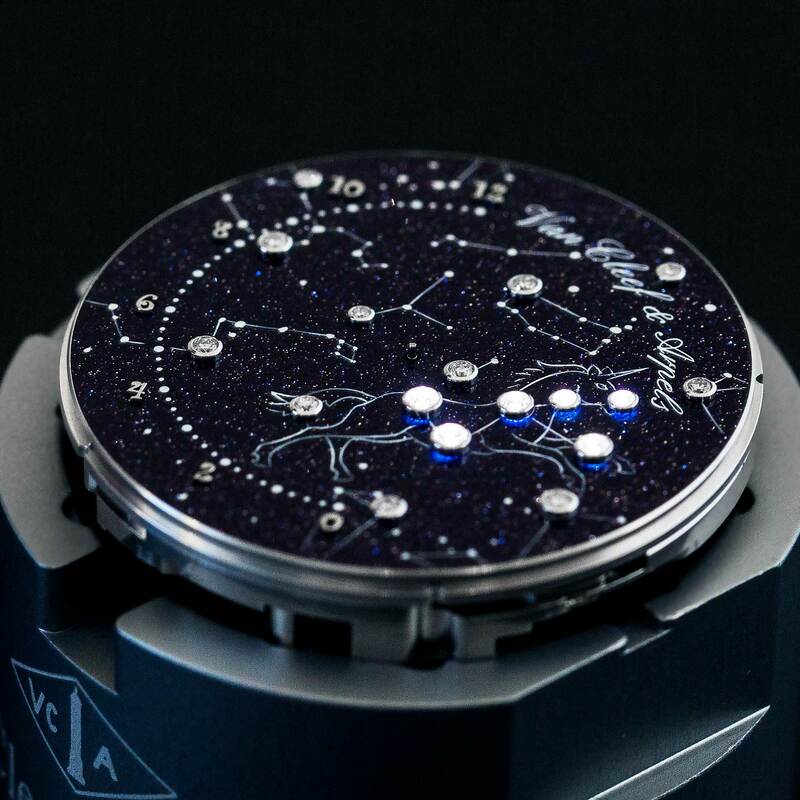 The Midnight Nuit Lumineuse features a dark blue, aventurine glass sky on which a number of the major constellations are traced with thin white lines and their stars represented by diamonds. 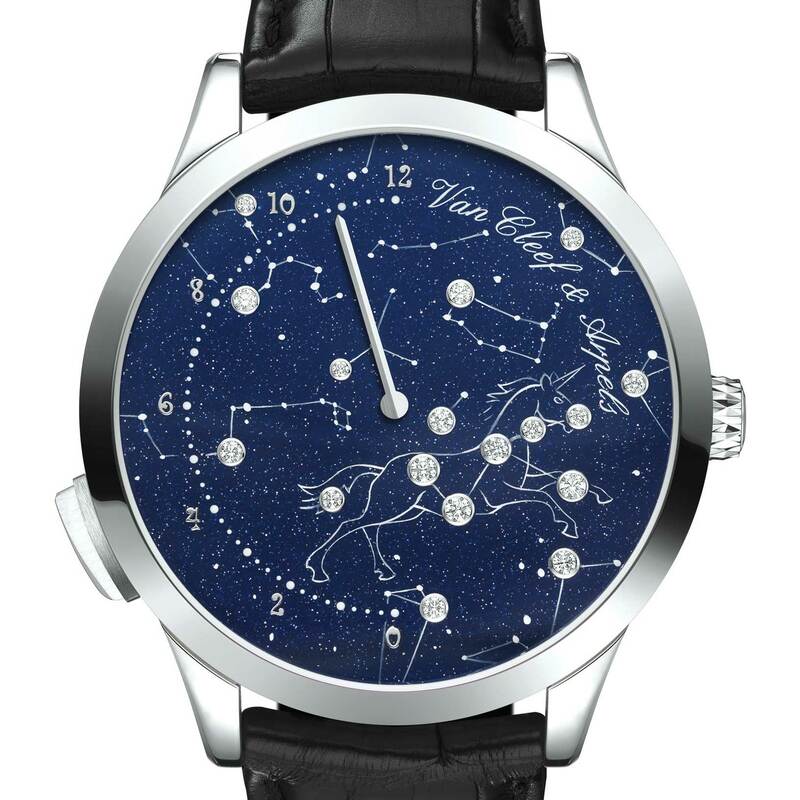 Revisiting a tradition from 1970, prime of place is given to the unicorn Monoceros and its six stars. When a pusher at the side of the dial is pressed, the diamonds of the unicorn shine brightly for about four seconds, illuminated electro-mechanically by LEDs beneath them. 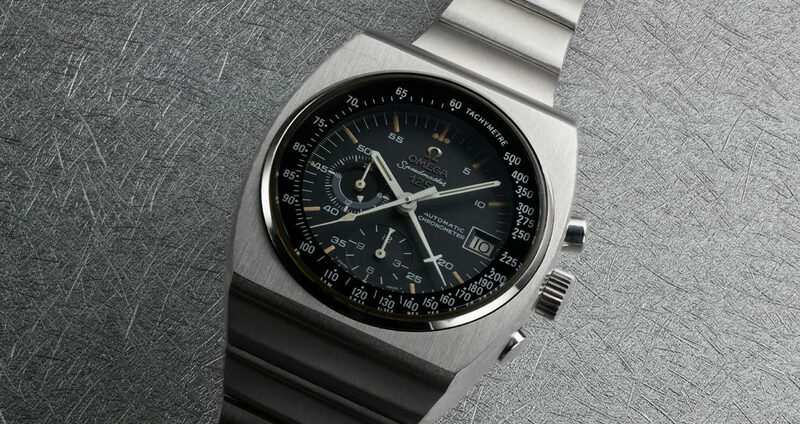 Time is indicated by a single retrograde hour hand travelling halfway around the dial. The hours are divided into quarters so you can make a pretty good stab at telling the time. At least you will never be completely in the dark.